Leslie Basham: Here’s Nancy DeMoss Wolgemuth. Nancy DeMoss Wolgemuth: Do you have a heart for Jesus? Do you have a heart for the good news, a heart for the gospel . . . to go out and change lives? Don’t underestimate the value of using whatever means God may have given you to help advance the gospel. Leslie: This is Revive Our Hearts with Nancy DeMoss Wolgemuth, author of The Quiet Place, for Tuesday, February 12, 2019. 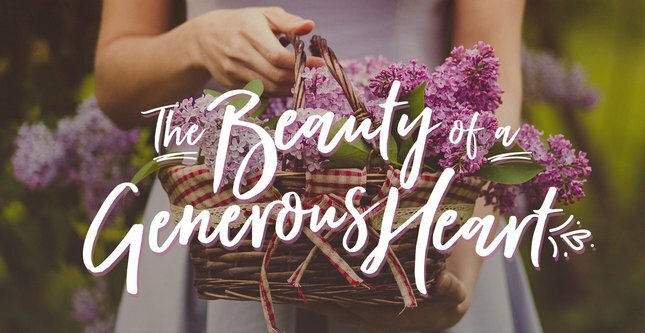 Nancy’s in day two of a series called "The Beauty of a Generous Heart." Nancy: We’re looking at just a short little paragraph in Luke chapter 8, the first three verses. If you missed yesterday’s session, you can go to ReviveOurHearts.com. You can read the transcript; you can listen to the audio. Soon afterward he went on through cities and villages, proclaiming and bringing the good news of the kingdom of God. And the twelve were with him . . . and also some women who had been healed of evil spirits and infirmities: Mary, called Magdalene, from whom seven demons had gone out, and Joanna, the wife of Chuza, Herod's household manager, and Susanna, and many others, who provided for them out of their means. That's the phrase we want to look at today, "who provided for them out of their means." So here were women, three of them named, and then many others who remain unnamed, who were indebted to Jesus. They were grateful. They had received much from Him, and they owed Him a great debt of love, and they wanted to give back to Him. So the passage says they provided not for Him out of their means. It says they provided “for them” out of their means. Who is the “them?” Who was with Jesus? The twelve—the disciples. Jesus and the twelve were traveling in ministry, and then this little band of women assembled, and they “provided for them”—the disciples and Jesus—who had needs related to their itinerant ministry. They had no other means of support in some cases; they were mostly not wealthy men. Several of them were fishermen. They couldn’t run their family fishing business while they were out traveling with Jesus. They had left everything to follow Him, so how were they supposed to have their needs met? How were they supposed to eat? We’re talking practical needs. God uses this little band of women not just to support Jesus—who was the main speaker, teacher, leader, the rabbi—but also to help support those who served with Him in lesser roles. “They provided out of their means.” I think the New King James says here, “Out of their private means.” This is resources, of some sort, to which they had access. And they used those resources, those means, their own personal means—their checkbook, their bank account, their bag of coins, whatever—to provide for Jesus. Now this suggests that these women had independent means of some sort. It doesn’t mean they were wealthy. Joanna may have been. We don’t know. But it does mean that they took what they had and what they had could have been used for other purposes. They invested out of what they had in Jesus. And whatever they invested in Him means they couldn’t use it somewhere else. But they were glad to do that, because they had been healed of spiritual and physical diseases and infirmities. Now, this group of women—they weren’t “groupies.” They weren’t passive spectators. They were active contributors to Jesus’ mission. They were part of the ministry. They were a part of His evangelizing, proclaiming the good news. They supported Jesus as He did that, and their giving was an expression or an outgrowth, a result of, what Jesus had done in their lives and a result of being with Him. It wasn’t like, “We’re going to take and offering, and who can come up with money for lunch today?” This looks to me like something they just did as an outgrowth, an expression, of their devotion to Christ. I don’t think these women were looking for a ministry or looking for recognition or significance. Most of them aren’t even named (it says “many others”); they just wanted to be with Him. As they walked with Him, they looked around, and they became sensitive to practical needs God could use them to help meet. And they did—they ministered in practical ways. Jesus and the disciples had to eat. Now, that might seem mundane or insignificant as far as ministry goes. It’s not glamorous to buy groceries, go to the market to pick out the food, to prepare it, to serve it, but this ministry of meeting physical needs was not unimportant. In fact, God valued it so much that the Holy Spirit inspired this phrase to be included in the Scripture, and every word of God is meaningful. It’s significant, it’s valuable, it’s profitable. “They provided for them out of their means.” That mattered to God enough that He recorded it for us to read it today. And the provision, I think, from all we can put together in the gospels, was not lavish. It was simple. Jesus, we’re told, didn’t have a place to lay His head. So they weren’t footing the bill for Jesus to stay in five-star hotels. He died owning nothing but His clothes, but he and his disciples—we do know from other parts of Scripture—did contribute to the poor. They were able to be generous. These women, apparently, had a part in making that possible, making the daily needs of ongoing ministry able to be met, and then enough that Jesus and the disciples could have something to give. Now think about this. Jesus could supernaturally have provided for all these practical needs without the help of these women. He had supernaturally healed these women. He had delivered them from demons and infirmities and diseases. You don’t think He could have provided breakfast? In fact, on two occasions, He performed miracles to feed multitudes of hungry followers. He could have done that here. He was God. But He didn’t choose to do it that way in this case. Why not? Well, Scripture doesn’t tell us why not, but as I’ve been meditating on this, let me just tell you some of the thoughts I’ve had. First of all, I think it was an evidence of His humiliation, His condescension. We never see Jesus using His divine power to meet His own needs. He laid aside the rights, the privileges, of divinity, and He humbled Himself. He humbled Himself. He stooped so far down that He—God Himself!—the very Son of God needed this kind of help. He humbly accepted the generosity and the support of these women. Let me read to you what two commentators have had to say about this point. William Jay says, “He was Lord of all, but had not where to lay his head, and was relieved by the creatures of His power.” Sweet. So we have this picture of a little company of women of wealth taking care of the group. It is full of beauty. I always see here, for myself, the grace of Christ—that He was content to be supported in that way, to live on charity while He carried on His mighty ministry. It seems to me as though that little group of women will always have an honored place in the glory-land, because they took care of the Lord of glory during those years of earthly ministry. Christ had first ministered to them, and then they ministered to Him. Sweet, sweet picture. And then, Jesus allowing these women to do this provided an opportunity for them to give. What a privilege to be a part of Jesus’ ministry in this way! It’s a reminder that we have a greater need to give than any ministry has a need to receive. It’s a joy to give, It’s a privilege to give. It’s more blessed to give than to receive, and Jesus wanted them to have that blessing. And then, this was consistent with the model we see in the Old Testament, of providing for God’s service. The Levites and the priests were to be supported by the people they served. We see prophets in the Old Testament . . . Elijah, who was cared for by the widow of Zarephath—the poverty-stricken widow of Zarephath (I might add). And Elisha, who was provided for by the wealthy woman of Shunem. I’ve had the joy of being on both ends of this kind of practical ministry. As I’ve been thinking about this passage, I ran into a friend at the grocery store a week or so ago. She’s a young mom with five children, five little ones. She’s a very generous, kind woman. She has often blessed me in really practical ways. She’s often brought meals when I was writing a book or preparing messages for radio. She finds such joy in sharing in our ministry in that way. She’s a sacrificial giver. I’m so, so grateful. She and her husband also serve together in ministry, and they live very simply—single-income—and I know they have needs. She’s met my needs so many times that, as we were standing there in the grocery store just talking, updating, praying together, just before we left, I felt prompted. Her cart was still empty, she was just getting started. I pulled out of my purse a little bit of change I had, maybe forty dollars—something like that. I handed it to her and said, “Use this to help with some groceries for your family.” She has been such an encouragement to me many times, and in that moment the Lord let me be an encouragement to her. Jesus letting the women give in this way fulfilled a biblical principle that we find in the Old and New Testaments about our responsibility to minister to the material needs of those who minister to us spiritually. Paul said, “It’s not wrong for me to take an offering.” Now, in some cases he said, “I’m not going to.” In fact, to the Corinthians he said that—for specific reasons—but he said, “It’s not wrong.” In fact, God has said that those who preach the Word should be supported by those who receive the ministry of the Word. Paul says the same thing in Galatians 6:6: “Let the one who is taught the word share all good things with the one who teaches.” And so, these women supported and cared for Jesus, their Rabbi, their Shepherd, their Leader, their Teacher, their Friend, their Deliverer, their Healer. The women who had come with him from Galilee followed and saw the tomb and how his body was laid. Then they returned and prepared spices and ointments. On the Sabbath they rested according to the commandment. But on the first day of the week, at early dawn, they went to the tomb, taking the spices they had prepared. . . . Now it was Mary Magdalene and Joanna and Mary the mother of James and the other women with them who told these things to the apostles” (Luke 24:1, 10). Told what things? He is risen! He’s alive! They got that incredible blessing of being the first to receive the news of the resurrection, because they were tending to the practical needs, the practical concerns. They were not making a big deal about it, not hoping they’d get written up and we’d read about it today. These women honored and blessed Christ. They didn’t do it to receive accolades or human recognition or applause or honor—but God honored these women. There have been others like them throughout church history who, out of their means, have supported the work and the ministry of Christ to make it possible for the gospel to go out. I have a friend named John Rinehart who’s written a book called Gospel Patrons, and in that book he tells the stories of those who have been behind—supporting the work of—some of the greatest outreaches and kingdom efforts throughout history. William Tyndale, George Whitefield—others whose names you would immediately recognize, who have done the work of the ministry—but behind them, there were people whose names you probably don’t know who were supporting, who were sponsoring, who were underwriting, who were making it possible for that ministry to go on. These are gospel patrons. That’s what these women were—gospel patrons. I think of another woman named Selina Hastings who was born into a wealthy British family in 1707. She married at the age of twenty-one, and when she did she became the Countess of Huntingdon, or as she is often referred to, Lady Huntingdon. Lady Huntingdon lived an upright religious life, but she was trusting in her own righteousness to save her. And then, at the age of thirty, her assurance about her spiritual soul-condition was shaken as she heard twenty-two-year-old George Whitefield preach the gospel. Well, about that time she became ill, and she thought she was dying. She began on her deathbed to feel the insufficiency of trusting in herself when she was facing eternity. Let me read to you what one of her biographers said about her conversion. She felt an earnest desire to cast herself wholly upon Christ for life and salvation. She instantly, from her bed, lifted up her heart to Jesus the Savior . . . and immediately, all her distress and fear were removed and she was filled with peace and joy in believing. She was restored to perfect health. She determined, thence forward, to present herself to God as a living sacrifice, wholly and acceptable, which she was convinced was her reasonable service. Doesn’t that remind you of some of these women in Jesus’ little band, these gospel patrons? After her conversion, Lady Huntingdon became a passionate follower of Christ. Rather than spending all her time socializing with her wealthy peers, she began to reach out in the name of Jesus to minister to the poor around her. When she was thirty-nine years old, her husband died, and from that point until her own death forty-five years later (at the age of eighty-three) she devoted her whole life to prayer, evangelism, and using her wealth and influence to help further the gospel. She was a generous supporter of many evangelical ministries and preachers in Britain and in the United States. She was a major benefactor in the ministry of George Whitefield, and she had a significant role in the Second Great Awakening in the eighteenth century. Lady Huntingdon. One in this sisterhood . . . this group of women who provided for Jesus and His associates out of her means. And I’m so grateful as I think about these women and others like them, for many generous women whose lives have been touched, transformed by Christ through the various outreaches of Revive Our Hearts. They’ve come to know Jesus. Their marriages have been reconciled, healed, restored, forgiven. Their consciences made clear, broken relationships restored. I think of one woman who has been encouraged and discipled by listening to the Revive Our Hearts podcast over many years while she’s been suffering in an extremely difficult marriage to a husband addicted to alcohol and prescription drugs. I think of another woman who was delivered from years of deep bitterness and emotional and mental dysfunction as a result of plumbing the archives of Revive Our Hearts and finding resources that God used to help set her free. And now, she’s one of the most generous supporters (along with her husband) of this ministry. I think of another woman who, for many years, was married to a committed unbeliever—and how she was so faithful, over many years of marriage. God used this ministry to help encourage and sustain her, and her husband came to know Jesus on his deathbed. She’s so thankful! She’s been a faithful woman, and she’s been one of the most faithful supporters of this ministry. So, as we make application of this passage, my question is, “What means do you have to offer for the support of Christ and the support of His kingdom?” What means has God given you? You say, “I’m not wealthy.” We don’t know that all these women were wealthy. Some of them may have been, many of them may not have been. Many of the women who support this ministry—most of them—are not women of great means, but they give out of what they have. And that’s all God asks us to give out of. So what means do you have—not just to give to this ministry—but to support the work of Christ, His kingdom, the good news going out? Maybe it is giving to meet the financial needs of your local church—and that ought to be true to every one of us. Maybe it’s supporting missionaries, Christian workers. Maybe it’s in other ways—caring for little ones in the nursery so their parents can sit through the church service and hear the preached Word. Maybe it’s volunteering time in your church office or your women’s ministry or children’s or youth ministry or local pregnancy care ministry. We’ve met women here, in the last few days in the metroplex, who are serving the Lord in many different capacities God has given them to be a blessing, to see the gospel furthered. Maybe it’s preparing food or providing administrative services for a church or community outreach. Maybe it’s providing childcare so your pastor and his wife can have a much-needed date. Maybe it’s hosting missionaries or Christian workers in your home for meals, or providing housing for an extended period of time while they’re on furlough. You say, “I don’t have means.” Do you have an extra bedroom in your home? Maybe you could further the gospel by opening up that bedroom to be used by someone who needs Jesus, or someone who’s a servant of the Lord. The epistle of 3 John tells us that when we provide practical support for those who are doing the Lord’s work, we are actually fellow-workers with them. Fellow workers with them! You say, “I couldn’t get up and teach; I couldn’t get up and preach; I can’t lead an organization; I can’t . . .” But what can you do? Has Jesus done a work in your life—something that makes you love Him? Have you spent time with Him? You know how powerful He is; you know how great He is; you know how good this good news is, and you want others to know it! Scripture also tells us that not only are we fellow-laborers when we provide that kind of support, but that we will also share in the reward of those who are doing the upfront work. In Matthew 10, Jesus tells us we will share in their reward. Listen. When we give to support kingdom work—the work of Jesus in this world—that demonstrates where our heart is. The Scripture says where your treasure is, there your heart will be also. Where we invest, that’s what we’re going to love. But it’s also true that, where our heart is, there our treasure will be also. Do you have a heart for Jesus? Do you have a heart for the good news—a heart for the gospel, to go out and change lives? I want to encourage you to become one of this band of women—faithful, loyal women who were with Jesus. They learned from Him, they listened to Him, they sat under His ministry, and then they provided for His needs out of their means. Don’t underestimate the value of using whatever means God may have given you to help advance the gospel. And don’t underestimate the value of giving to minister to the physical and the material needs of those who are serving Christ, proclaiming the gospel and advancing His kingdom. So, Lord, I pray that You would make practical application to each of our hearts. What means have You entrusted to us, and how can we make those resources available—open hands, open heart? We say, “Lord, I want to see Your kingdom come; I want to see Your will be done. Listen, all the trinkets and stuff that we spend so much of our time and effort and focus and money on, most of that is going to burn. It’s not going to last for eternity. But those who are these gospel patrons, this sisterhood of women who supported Jesus . . . they may not be as wealthy in this life, but they’ll be the wealthy ones in the life to come. They honored Jesus. Jesus honored them. Lord, we want to be among those women—loving, giving to You, supporting out of the means You’ve given us to see Your kingdom advanced. We pray it in Jesus’ name, amen. Leslie: When you truly think about what Jesus has done for us, the natural outflow is generosity. Nancy DeMoss Wolgemuth has been showing us why. Revive Our Hearts relies on gospel patrons like we heard about today. They make it possible for you to hear this program. And when you support Revive Our Hearts with your prayers and your donations, it’s making a difference day after day, around the world. When you make a gift of any amount today, we’d like to thank you by sending a pamphlet Nancy wrote. It’s called, “Giving God’s Way: Biblical Guidelines for Giving.” You’ll learn how God’s Word describes a generous heart, and what it means to lay up treasure in heaven. Ask for this pamphlet, “Giving God’s Way,” when you give any amount online or by phone. The web address is ReviveOurHearts.com, or call 1–800–569–5959. Thank you so much for helping Revive Our Hearts as together we call women to greater freedom, fullness, and fruitfulness in Christ. Would others describe you as a generous person? Tomorrow, get to know some women whose lives are marked by generosity. Hear from their example and understand the joy of generosity in greater ways for yourself. That’s tomorrow on Revive Our Hearts. Revive Our Hearts with Nancy DeMoss Wolgemuth is helping you develop a heart for the gospel. It's an outreach of Life Action Ministries.